Sisters—and dreams—are unique in their ability to inspire, encourage and change the world. For 150 years, Louisa May Alcott’s Little Women has motivated women of all ages to dream together and celebrate family. Coming to theaters for the first time, a modern retelling of LITTLE WOMEN brings a new generation together with their mothers, sisters and friends. From girls playing in the attic to women living with purpose, the March sisters—Meg, Jo, Beth and Amy—are committed to always supporting each other. Yet, growing up sometimes means growing apart. An aspiring writer, Jo leaves for New York determined to publish a novel. In the wake of rejected draft upon draft, her editor challenges Jo to write about something more interesting—her family. When tragedy brings the sisters back home, sticking together takes on new meaning. As Jo comforts her sick sister, Beth asks for one thing: a story. Jo knows the perfect one … by heart. 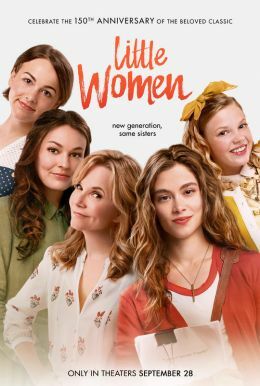 Starring Lea Thompson as Marmee and featuring a talented cast, including Lucas Grabeel and Ian Bohen, LITTLE WOMEN tells the story of the same beloved sisters to a new generation. Celebrating dreams, family and unconditional love, LITTLE WOMEN opens in theaters this fall.